Turner and IMG’s ELEAGUE Street Fighter® V Invitational 2018 will be the first major fighting game tournament to track both competitors’ in-game eye movements at the same time, when the five-week showdown begins Friday, June 1, at 3 p.m. ET on Twitch. Featured Friday matches will air on TBS at 11 p.m. ET/PT each week. ELEAGUE, in collaboration with its long-standing technology and marketing partner Dell Gaming, will leverage eye-tracking technology to offer fans unprecedented access to the minds of professional Street Fighter players. The Invitational will see 22 of the world’s elite players, along with two rising amateurs who emerged from ELEAGUE The Challenger: Street Fighter V, compete for $250,000 in prize money. Micro projectors and sensors supplied by Tobii Group will track each player’s eye movements and use the data to create a visual of where the competitors look throughout a given match (see the image below). The overlay will be shown during special Dell “Getting Technical” studio analysis segments. 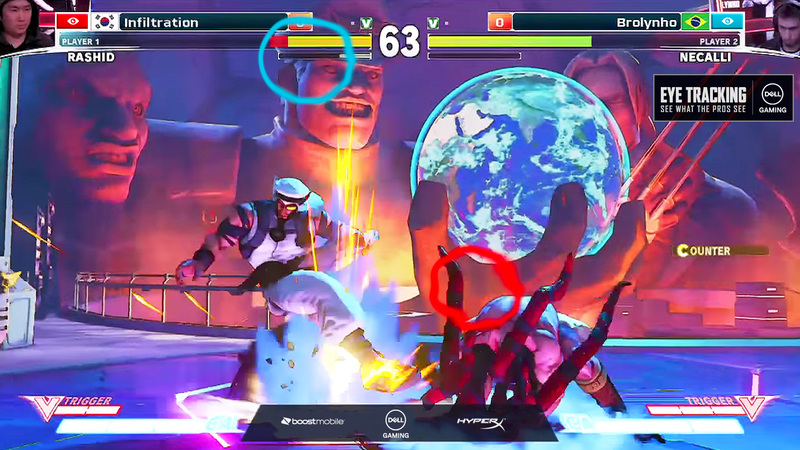 ELEAGUE’s commentary team can use the enhanced highlights to offer fans a more detailed understanding of how the world’s best Street Fighter players gain match-deciding advantages during pivotal in-game moments. Fully-produced live event studio coverage that is tailored for Twitch distribution, while coinciding with TBS coverage – including a standalone set and commentators dedicated to streaming audiences. Media members interested in credential access to cover the Invitational, including a behind-the-scenes tour of the eye-tracking infrastructure at Turner Studios, can contact Turner Sports PR at turnersportspr@turner.com or (404) 575-6765. Opportunities to cover the event remotely, including via media teleconferences with players, will be available on a weekly basis.